to perform a status check and get operator feedback in connection with a new order for upgrade of the three MSS 6000 systems operated in Canada. Our engineers went through the systems and went flying together with Transport Canada operators. A lot of good discussions on different features of the systems took place during and after the flights. The new order consists of a software upgrade to improve the efficiency and reliability of the systems as well as provide new functions for data export. 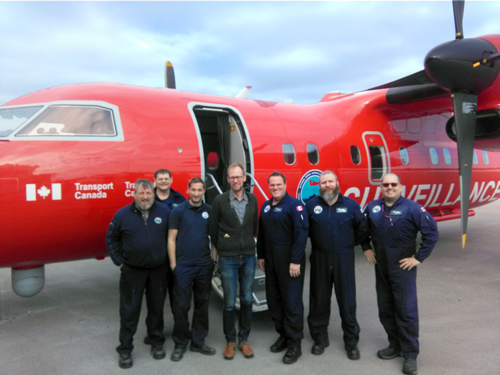 “We are very happy with our long-term relationship with Transport Canada”, says Mr. Olov Fäst, President of ST Airborne Systems “and look forward to improving the technology that will enhance the surveillance mission over Canadian waters. Transport Canada operates three MSS 6000 systems on board two Dash 8 and one Dash 7 aircraft. The first system was installed in 2006. For more information please follow the link.